Mr. Thomas Miller had his first drum lesson in 1970 at the age of 10. 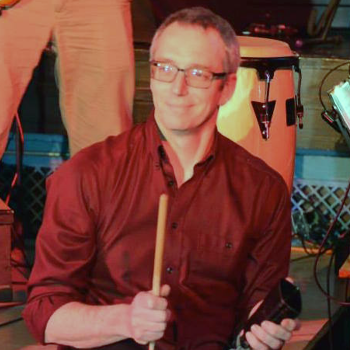 Since then, he has played as a percussionist in concert bands, orchestras, marching bands, and percussion ensembles, and as an instrumentalist for jazz choirs and theater productions. He has also performed and recorded music with numerous bands over the years, playing rock, jazz, blues, and Celtic music. Tom and his wife Kirsten, along with their eight children, moved to Moscow from their home state of Illinois in 2011. He is a member of Christ Church and plays timpani there each Sunday. Mr. Miller has a degree in physiology from Southern Illinois University and a degree in physical therapy from Northwestern University. He works as a physical therapist for Pullman Regional Hospital in Pullman, Washington.